Above: Aloe ferox at Desert Theater nursery, Escondido, CA. From my video, Spectacular Aloes in Flower. Large, sculptural aloes with brilliant, Popsicle-like flowers make striking garden plants. Midwinter is peak aloe bloom season and an excellent time to see them in nurseries and landscapes. Aloe ferox, or Cape Aloe, might be considered a tree because of its height at maturity–6 to 8 feet with bloom spikes that add another couple of feet—but unlike true tree aloes, it’s not branching. Growth is from the center of the rosette, and old leaves dry and wither, so eventually you have a large octopus of a plant atop a columnar trunk. Although the skirt of dry leaves hugging the trunk can be removed to make the plant more tidy, it’s best to keep them on. As in the aloe’s native habit of South Africa, these wraparound leaves protect the trunk from excessive heat, sun and cold. Aloe ferox does well in Southern California except in mountain and desert areas, and is hardy to the low 20s. Two specimens of Aloe marlothii in bloom flank an Aloe ferox not in bloom. Aloe marlothii is similar to Aloe ferox and hybridizes readily with it, so it’s often hard to tell which is which. A. marlothii blooms later (in early spring), flower stems branch horizontally, and leaves are prickled—sometimes heavily so. For sources, see my list of nurseries. Find comprehensive info about aloes in my books Designing with Succulents, 2nd ed., pp. 182-190; and Succulents Simplified, pp. 185-197. Grow Aloe ferox! Just released. See examples of mature Aloe ferox in the landscape and learn more about this big, beautiful succulent. See in-ground aloes blooming en masse at Desert Theater nursery north of San Diego. Explore a colorful, waterwise Rancho Santa Fe garden and get plenty of great designs ideas, too! Remarkably, the spination of certain cacti suggests snowflakes, something I first noticed years ago at a succulent specialty nursery. I was there to photograph aloes in bloom, but I’d come too early in the season. I thought of leaving, and I’m so glad I didn’t! That afternoon forever changed the way I see certain succulent plants. It’s a paradox worth savoring: Spines on hefty desert plants resemble delicate, geometric ice crystals. Do check for cactus snowflakes the next time you visit a succulent specialty nursery, whether you bring any home or not. To capture them with your camera, simply hold the lens horizontally above the plants. P.S. If you search online for “cactus snowflake,” you’ll get images of succulents that look like cacti but aren’t. They’re Euphorbia polygona, the green form and silvery gray ‘Snowflake’…which has been renamed “Euphorbia horrida ‘Snowflake’. But as you can see, there’s nothing horrid about it! Also in my own collection is this Euphorbia meloformis. The green is new growth that happened after the plant got sunburned. Pretty cool, eh? Enjoy my article on succulents with spiral patterns: Many cacti and succulents form geometric spirals similar to those of sunflowers, pine cones and nautilus shells. Spiral leaf arrangements funnel rain to roots, and keep upper leaves from…[Continue reading]. A dove in a prickly pear tree. Two agave pups and a dove in a prickly pear tree. Three hens-and-chicks, two agave pups and a dove in a prickly pear tree. Four claret cups, three hens-and-chicks, two agave pups and a dove in a prickly pear tree. Five golden barrels, four claret cups, three hens-and-chicks, two agave pups and a dove in a prickly pear tree. Six obesas blooming, five golden barrels, four claret cups, three hens-and-chicks, two agave pups and a dove in a prickly pear tree. Seven saguaros spinning, six obesas blooming, five golden barrels, four claret cups, three hens-and-chicks, two agave pups and a dove in a prickly pear tree. Eight mams a-milking, seven saguaros spinning, six obesas blooming, five golden barrels, four claret cups, three hens-and-chicks, two agave pups and a dove in a prickly pear tree. Nine lithops dancing, eight mams a-milking, seven saguaros spinning, six obesas blooming, five golden barrels, four claret cups, three hens-and-chicks, two agave pups and a dove in a prickly pear tree. Ten chollas jumping, nine lithops dancing, eight mams a-milking, seven saguaros spinning, six obesas blooming, five golden barrels, four claret cups, three hens-and-chicks, two agave pups and a dove in a prickly pear tree. Eleven trips to Tucson, ten chollas jumping, nine lithops dancing, eight mams a-milking, seven saguaros spinning, six obesas blooming, five golden barrels, four claret cups, three hens-and-chicks, two agave pups and a dove in a prickly pear tree. Twelve ‘Sunburst’ drumming, eleven trips to Tucson, ten chollas jumping, nine lithops dancing, eight mams a-milking, seven saguaros spinning, six obesas blooming, five golden barrels, four claret cups, three hens-and-chicks, two agave pups and a dove in a prickly pear tree. Now, if you’d like to suggest alternative or more alliterative lyrics, please do so. I likely have photos to match. I’ll update this as good suggestions come along. Want to launch a lifelong love of gardening? Give a basket of baby succulents. When in my 20s, I had 30 houseplants. Before leaving on vacation, I asked a neighbor to tend them. To make it easier for her (ha), I labeled each with a number corresponding to a hand-drawn map of my apartment’s interior, and to a list that gave each plant’s watering schedule and amount. If that sounds excessive—or obsessive—consider that #plantparenthood on Instagram has over 150K posts and averages 250 new ones daily. So what does that mean for you, dear reader, since you’re probably not in that demographic? (Most of my subscribers are seasoned gardeners 40+. That’s who we are, and we’re proud of it.) Well, you now have an idea for that lovely niece or DIL you normally just throw a gift card at: a Plant-Parent Gift Basket. Select an assortment of chubby succulents, tuck them into a box or basket, and pad with tissue paper. Wrap the whole shebang in clear cellophane and tie with ribbon, perhaps with a pacifier attached (kidding…sort of). Include a copy of Succulents Simplified or Succulent Container Gardens. Email me if you want autographed, personalized copies. Or if she likes videos, give her my online class, Stunning Succulent Arrangements. Watch it together! 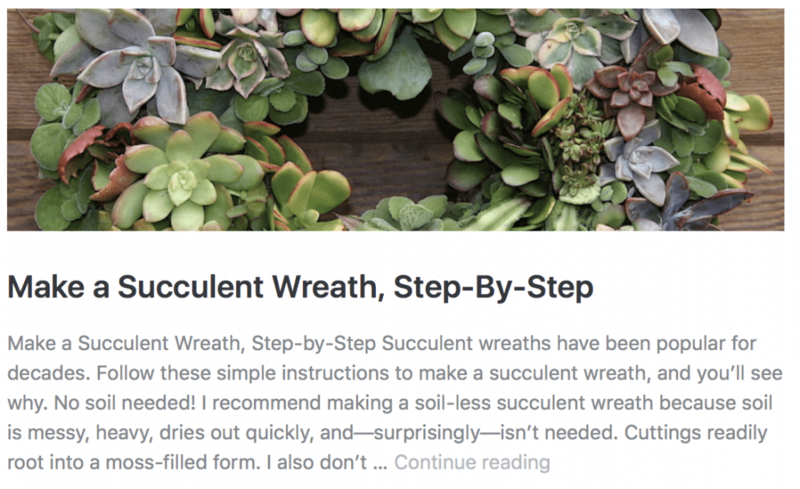 The Easy Way (recommended if you’re shipping to the recipient): Send a gift arrangement from Succulently Urban. Owner/designer Marialuisa Kaprielian does gorgeous work, her plants are superb, and her prices are awesome. Plus her echeverias (shown here) are kitten-cute. Marialuisa will ship two-day or overnight until mid-December. When you hear squeals of glee, suggest that the giftee post occasional photos on Instagram. It’s a great way to stay connected and watch little darlings grow. About half the photos at Instagram’s #plantparent and #plantparenthood show succulents. Do tag me in the comments. Auntie Debra wants to see too! Also watch my YouTube video in which I assemble a gift basket of echeverias for my own DIL. About 250 cactus pads from Jim’s garden cover the 7-foot-tall tree. He and friend Mark Faulkner spent two days assembling it on a conical iron frame wrapped with poultry fencing. “We wore special gloves called Thorn Armor that did their best to protect our hands,” Jim says. The men wired each pad at its stem end, then hooked it to the frame. Jim’s not planning on leaving the tree up past winter, but it has the potential to look good for at least six months. L-R: Cactus pad soap dish comes with a bar of prickly pear soap and a cactus ornament; two pots decorated with agave leaves; an aloe-in-bloom plate; a vase inspired by columnar cacti. If you’re keen to make a cactus tree or just want to know more, here’s my Q-and-A with Jim. Q: What’s the approximate diameter of the base of the tree? Q: Did you secure the chicken wire to the frame with zip ties? A: No, we used bailing wire. Q: Where did you get the frame? A: I bought the metal tree frame from a retail display company, Tripar. Q: How and why did you remove the spines? A: We removed some of the daunting spines, not all, with scissors to make them easier to handle and to make a bit safer for spectators who are taking pictures of themselves next to the tree. Q: What’s the cloth under each pad, and what purpose does it serve? A: It’s natural colored burlap, and it was simply an aesthetic choice to give the pads some distinction between the layers. Q: Figure 3 lbs/pad x 250 = 750 lbs. What’s the tree standing on? A: The tree is on one of the iron table bases I have made for making my ceramic-topped tables. We wanted to bring the tree up a bit higher above the prickly pear garden in front of my gallery. I clamped the base of the tree to the top of the table base. Q: What kind of hooks did you use? A: We made our own hooks from bailing wire. We threaded the wire through the woody end of the pad and looped it around, twisted it and bent it into a hook. Q: Despite wearing $50 Thorn Armor gloves, did you get poked? A: They worked really great, but by the end of the day, they were a bit saturated with spines that eventually made their way through. They really helped. We couldn’t have done it without them, but nothing is foolproof. Q: I see that you used seed pods and gourds for the garland, but what’s the white-dotted vine? A: It’s a garland from a floral supply shop that we added natural elements to. Q: Anything else a do-it-yourselfer should know besides “start at the bottom, overlap the pads like shingles, and use smaller pads as you go higher”? A: That’s pretty much it, except that we ended up using a lot more pads than we originally anticipated…probably by twice as many! Also, as you mentioned, it’s a lot of weight so we really needed to secure the tree frame wherever we could and secure it tightly to the base. Q: What are you going to do with all those pads when you take down the tree? A: Being a lover of succulents and succulent gardening, the pads will come back home with me and be planted in my yard!